Washington, D.C. (May 4, 2017) — Promark Real Estate Services’ innovative office-to-residential conversion project, the Octave 1320 in Silver Spring, earned the Excellence in Adaptive Reuse award this week from the prestigious Urban Land Institute Washington, a District Council of the Urban Land Institute (ULI). 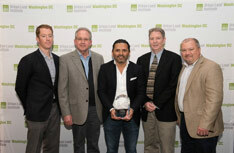 The award is a new category for the organization hosting its third-annual Real Estate Trends Conference Awards Program, a conference component that highlights innovative development under way in the Metropolitan Washington Region. The ULI Washington awards recognize innovative projects, policies, and initiatives that contribute to the enhancement of vibrant neighborhoods, exemplify creative problem solving, and celebrate visionary thinking. Promark’s vision for the project was born in 2015 with the assistance of a $4.1 million Montgomery County investment and financing from BB&T. Today the 102-unit development, designed by BKV Group, is nearly sold-out, and the County’s investment has been completely repaid with a return. About 80 percent of the new condo owners are first-time homebuyers, many of them millennials. Almost half would qualify as workforce buyers based on the county’s income parameters. Using small but efficient design principals, the 450-square-feet to 840-square-feet condos have sold for about $235,000 on average for one-bedroom units, and $350,000 on average for two-bedroom units. Community amenities include a fitness center, a common-area lounge with fireplace, an enclosed rooftop lounge that can be reserved, a huge roof deck and secured bike parking. Octave 1320 was also recognized by Delta Associates as the 2016 Best Washington/Baltimore Adaptive Reuse Condominium Community during the group’s 20th Annual Apartment and Condominium Industry Awards for Excellence.